Taking the Scenic Route with Mark Leslie of Martello Media, Dublin, Ireland; Opening of Denver Bike Sharing Program in Denver, Colorado; Tenderloin Egg Rolls and More at the Celebration Hotel in Celebration, Florida; Dog-Friendly Treats at the Woof Gang Dog Bakery, Celebration, Florida; Family Course With 17 Holes of Water at the Celebration Golf Club, Celebration, Florida; Old Florida Charm at the Celebration Hotel, Celebration, Florida; Summer Airfares to Florida from CheapOAir. 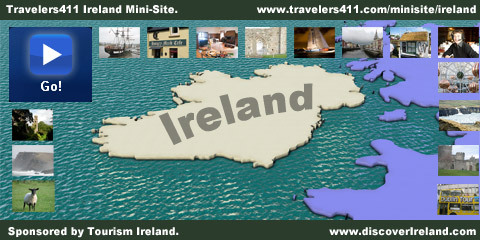 Travel Expert Stephanie Abrams and the “Travelers411” Radio Show start off the hour with Mark Leslie, Managing Director of Martello Media in Dublin, Ireland. The Yeats exhibit at the National Library designed by Mark Leslie's Martello Media. Thanks to the volcanic ash plume, Mark is taking the scenic route from Dublin to Pittsburgh to China. “In the last 8 days, I've taken 9 taxis, 7 trains, 5 closed airports, 3 metros in Paris, 4 London tubes, 1 BBC limousine, 1 Corvair sports car in America, and 1 Channel Tunnel to get in a big circle,” he says, adding that somewhere in all of this, his luggage vanished. Mark and Martello Media have made “the most incredible visitors' center installations” at Blackrock Observatory, the Cliffs of Moher, Glasnevin Cemetery, and the W. B. Yeats exhibit at Dublin's National Library, says Stephanie. Martello Media is currently preparing the 20,000 square foot Ireland pavilion for the 2010 World's Fair in Shanghai. The Yeats exhibit at the National Library designed by Mark Leslie's Martello Media. Mark Leslie (L) and Stephanie Abrams (R). Once in the city center, though, visitors will find “every type of experience, all at the same time,” says Mark. “It's kind of a time warp.” Shanghai has an older section with gardens, canal paths, and gondolas; art deco architecture from the 1920s and 1930s in the French Concession; and on the far banks of the river, “astonishingly tall buildings out of science fiction,” he says. The Yeats exhibit at the National Library designed by Mark Leslie's Martello Media. Mark Leslie (R) and Stephanie Abrams (L). Stephanie adds that Shanghai is a very international experience; going to the mall, she felt like she was shopping in Paris. “Every brand you know and every designer name you've ever heard are all there,” she says. Parry W. Burnap, Executive Director, Denver Bike Sharing, 2737 Larimer Street, Denver, Colorado, USA. Travel Expert Stephanie Abrams and the “Travelers411” Radio Show are off to Denver to talk with Parry Burnap, Executive Director of Denver Bike Sharing in Denver, Colorado. Bicycles cramming the sidewalks in Amsterdam. Photo by Dru Abrams. Hotel Teatro in Denver, Colorado. A daily membership is just $5 and a weekly membership is $20. For Denver residents, there are annual memberships. Parry suggests that travelers planning a trip to Denver go online and become members before arriving. “When you get here, you can come up to any kiosk and it will recognize your credit card,” she says. The Denver B-Cycle system encourages cyclists to wear helmets, but Colorado has no state law requiring them. “We learned that people don't really want to share helmets,” explains Parry. Zachary Martin, Executive Chef, Celebration Hotel, Celebration, (Orlando Region) Florida, USA. Travel Expert Stephanie Abrams and the "Travelers411" Radio Show sit down to eat with Zachary Martin, Executive Chef of the Celebration Hotel in Celebration, Florida. Celebration is in the Orlando area, but Stephanie describes it as feeling like you're in a village, far from the bustle of the theme parks. The Celebration Hotel recently became part of the Kessler Collection and was renamed the Bohemian Celebration Hotel. Downtown Disney in Orlando, Florida. Zachary was born and raised in New Orleans and trained at the Commander's Palace restaurant and under Chef Emeril Lagasse. True to his Louisiana roots, Zachary's favorite dish is jambalaya. At the Celebration Hotel, he specializes in a steakhouse-style menu that features lots of meat and seafood. The hotel's signature dish is a filet egg roll, which Zachary describes as "a center cut of beef tenderloin with blue cheese and house-made chili sauce. We put that in an egg roll wrapper, fry it, slice it up, and top it with lotus root salad with fried lotus root and fresh cilantro." Although the Gulf oil spill may disrupt seafood supplies, Zachary plans to simply change to other suppliers and serve fish that is not sourced from the Gulf until the spill is cleaned up. The Celebration Hotel is a boutique hotel with 115 rooms overlooking a lake. "Everything is very intimate and we do lots of hands-on work with guests," Zachary says. "It's the perfect destination to get away from the hustle and bustle of the big city." The Celebration Hotel also hosts conferences and weddings; the hotel has 10,000 square feet of meeting room space and the Sabal Ballroom, Aviary Ballroom, and Plantation Room for weddings and other functions. Guests can enjoy shops, restaurants, a golf course, and a movie theatre in the village of Celebration. Clara Allen, Franchisor, Founder, Woof Gang Dog Bakery, Florida, USA. Cara Allen, Franchisor and Founder of the Woof Gang Dog Bakery in Celebration, Florida, visits Travel Expert Stephanie Abrams and the "Travelers411" Radio Show. On the outside, says Stephanie, the Woof Gang Dog Bakery looks like a fine pastry shop, complete with donuts, cannolis, and other treats in the windows. Inside, Cara describes it as a gourmet dog bakery and one-stop shop for pets. "It's decorated in icing pink and carob brown—since dogs can't eat chocolate—and we sell delicious treats made right in the shop," she says, adding that all of the Woof Gang's products are made with natural ingredients. The shop also has pet items like toys, collars, and leashes. "We're lucky to be in a dog-friendly community, so we really wanted to complement the town with a shop where you can bring your pet," Cara explains. Mark Leslie, Managing Director, Martello Media, Dublin, Ireland. Kenny Nairn, Executive VP of Golf, Golf Pro, Celebration Golf Club, Celebration (Orlando Region), Florida, USA. Travel Expert Stephanie Abrams and the "Travelers411" Radio Show hit the greens with Kenny Nairn, Executive Vice President and Golf Pro at the Celebration Golf Club in Celebration, Florida. Celebration is in the Orlando area, but Stephanie calls the town "the cutest village you've ever seen" and "a nice escape at the end of the overload of stimuli that you get in Orlando." Visitors to Celebration can fly into Orlando or take Amtrak's Auto Train to Sanford, Florida, just a 30 minute drive away. Like the sport of golf itself, Kenny was born in St. Andrews, Scotland, and has lived in the US for 12 years. "I've been in Celebration for 9 years and I plan to leave in a wooden box," he jokes. He encourages visitors to explore the town of Celebration and make their way to the golf course. "So many people don't even know about Celebration, so they walk in and ask what it's all about," he says. Kenny even hosts a golf radio show on Leaderboard Radio, the local ESPN affiliate, on Monday nights from 6 to 8 PM. The Celebration Golf Club's course was designed by Robert Trent Jones, Sr. and his son, Robert Trent Jones, Jr. "The course is non-Floridian in that it's not flat," says Kenny. "Actually, it's quite undulating." The course is, however, good for family golfing since each hole has five sets of tees for kids who can't hit very far and experienced adult players alike. Kenny cautions players to bring plenty of extra golf balls, though—the course has 17 holes of water! Celebration Golf Academy. Stephanie Abrams with Kenny Nairn. Visitors who have left their extra balls at home can stock up at the 1250 square foot golf shop or from the traveling beverage cart. They can also work on avoiding the water hazards at the Celebration Golf Club's golf academy. "We have most of the gizmos that are out there," Kenny says, from videotapes to 3D models. In July 2010, the club plans to start building indoor studios where guests can practice their swings away from Florida's hot, humid summer weather and occasional thunderstorms. The club also has a partnership with Ping Golf Clubs and can fit players with special clubs. Cara Allen, Founder of the Woof Gang Dog Bakery in Celebration, Florida, returns briefly to the "Travelers411" Radio Show to chat with Travel Expert Stephanie Abrams. The Woof Gang Dog Bakery is a one-stop shop for pet treats and toys. "We have donuts, cannolis, cupcakes, and snickerdoodles for dogs," Cara says. "We make them all with human-grade ingredients, so they're safe for children or guests who eat them accidentally, but you might not appreciate the taste." Inside the Woof Gang Dog Bakery. The Woof Gang Dog Bakery also sells apparel for your pup, including raincoats, bathrobes, sports jerseys, collars, and leashes. "If you're traveling with your pet and leave something at home, we have all the essentials," Cara adds. "We have customers with dogs of all sizes and welcome other pets as well, including cats and even squirrels. We've found that everyone likes being out and about in Celebration with their pets; they're part of the family." Bill Miller, Sr. VP, Strategic Partnerships, CheapOAir.com, USA. Bill Miller, Senior Vice President of Strategic Partnerships at CheapOAir, returns to the "Travelers411" Radio Show to share summer airfares to Florida with Travel Expert Stephanie Abrams. All airfares quoted are round trip for a mid-July 2010 departure, Saturday to Saturday. Taxes and fees are not included. Bill starts with fares to Orlando, Florida from around the country. From Austin, Texas to Orlando, fares are $295; Boston to Orlando $294; New York City to Orlando, $329; Philadelphia to Orlando, $217; Pittsburgh to Orlando, $258; Denver to Orlando, $345; and Phoenix to Orlando, $310. A good alternative to the Orlando airport is Tampa, Bill suggests. Flights from Austin, Texas to Tampa run $317; Pittsburgh to Tampa, $251; and New York City to Tampa, $264. It's about an hour's drive from Tampa to the Orlando area, he says. Bill also has fares to other Florida cities, including Miami and Jacksonville. From New York City to Miami-Fort Lauderdale, it's $226; from Pittsburgh to Miami, $241; from Phoenix to Miami, $312. From Austin to Jacksonville, it's $303; Philadelphia to Jacksonville, $236; and Denver to Jacksonville, $279. "There's nothing over $345 to Florida from around the country," Bill says. For more information visit www.cheapoair.com or call toll-free 866.592.9685. Jon Wubbena, General Manager, Celebration Hotel, Celebration, (Orlando Region) Florida, USA. Travel Expert Stephanie Abrams and the "Travelers411" Radio Show visit the Celebration Hotel in Celebration, Florida to chat with General Manager Jon Wubbena. The hotel is now pet-friendly and accepts pets 25 pounds and under. Celebration Hotel also frequently hosts weddings on its lakefront terrace or in its two ballrooms. Celebration Hotel has 115 rooms and offers "very intimate, close, personalized service," according to Jon, who says, "We have the opportunity to truly get to know our guests and reach out to them directly." The hotel has been open for around 11 years and has an 'old Florida' feel, with dark mahogany floors, wood ceilings, and large fans. "It's like something you'd see in Jamaica or the Bahamas," Jon explains. "We want to think that when you arrive, you'll relax at once, but there's still a certain level of sophistication." The Celebration Golf Club was the last of four courses designed together by Robert Trent Jones, Sr. and his son, Robert Trent Jones, Jr.
Travel Expert Stephanie Abrams managed to find a piece of Ireland in Celebration, Florida: a shop called Shannon's of Celebration. "It's a cute little place, a taste of Ireland with a green phone booth outside and video of Ireland inside, owned by a couple from Kildare," she says. SVC is accredited by the New England Association of Schools and Colleges and is located in Bennington, Vermont.